When visiting our Mojave Desert region, we ask you to please practice responsible tourism and try to be good stewards of this desert land, so that our environment can remain safe and ecotourism-friendly for current and future generations of residents and visitors. Thank you! LEAVE NO TRACE: While enjoying your visit, help minimize your impact by staying on designated paths, packing out all trash, respecting other visitors and wildlife, and leaving natural and cultural resources as you find them. With increased attention focused on the California drought situation in recent years, residents and visitors have become more aware of water conservation and sustainable tourism practices. As desert residents, we have always been careful about protecting this precious resource–our water! We also support other measures that protect our desert and our planet. Help our lodging properties to conserve water by reusing your towels whenever possible and accepting their requests to limit changes of sheets and bedding. Help our restaurants by realizing they do not automatically serve water any more. You’ll have to ask. You’ll also have to ask for a plastic straw if you want one, as they are on a list of pollutants about to be banned in the state. Carry reusable bags when you travel, or buy a souvenir tote bag to use while visiting us. Our grocery stores, mini-markets, and local shops respect the state’s mandate to eliminate plastic bags. (Besides clogging landfills, they fly all over the desert!) Those places that continue to offer plastic bags will now charge for them. Reduce and recycle. Carry water in reusable containers, if possible. Water is important in the desert, and it’s better for the environment if you use coolers, insulated jugs, canteens or reusable water bottles. Help us reduce the amount of plastic bottles in our desert environment. If you do purchase them, recycle them in one of the recycle bins in our city, or ask the staff at your lodging to recycle them for you. Drive cautiously and obey the speed limit in our communities, in the park, and on our desert roads to help protect our wildlife, our residents, and your fellow travelers. If you encounter a desert tortoise on the road, try to avoid it; if you feel the need to help it along, lift carefully and move it across the road in the direction it is headed. Got a Hybrid? Use our free electric car charging station next to the Twentynine Palms Visitor Center & Gallery and Chamber of Commerce downtown. It’s located in the parking lot next to the building and Bucklin Park at Desert Queen Avenue and 29 Palms Hwy. (Hwy 62). The Mojave Desert Land Trust (MDLT) is a wonderful resource for sustainability in the desert and an important steward of our Mojave Desert public lands. Formed in 2006, MDLT, a non-profit organization located in Joshua Tree, has been recognized for its responsible governing and outstanding achievements in land preservation. 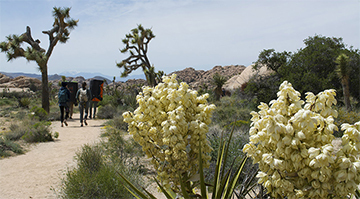 It has successfully added scenic Joshua tree forests and lands to Joshua Tree National Park and continually works to restore critical wildlife habitats and environmental resources to our public lands. Visit their website to see upcoming events and to learn how you can become involved in protecting the Mojave Desert. With nearly 3 million visitors coming to Joshua Tree National Park in the past year, traffic was becoming an issue on park roads and at entrances, and was straining the limits of designated parking areas inside the park to accommodate all the visitor vehicles. In an effort to mitigate this problem, the National Park Service, the City of Twentynine Palms, and Morongo Basin Transit Authority (MBTA) partnered to bring the RoadRunner Shuttle service into the park as a way for locals and visitors to leave their vehicles behind and ride in air-conditioned comfort into and around the park. See more information about the shuttle on our Trip Planner page. You may have noticed that the nights are dark here in the desert. We like it that way. The starry night sky is our biggest asset; therefore, light pollution is not our friend. Certainly if you have come from the big city, it can be quite an adjustment. We don’t want you stumbling to your car in the night, so a small flashlight is a good idea; many lodging hosts will loan one to you, if needed. If you are interested in astrotourism, this is the place! Being situated next to Joshua Tree National Park, an official Dark Sky Park, as designated by the IDA in 2017, our very own Sky’s The Limit Observatory and Nature Center offers fabulous night sky viewing. They have free star parties every Saturday night (except during a full moon) with telescopes and volunteer astronomers, and the site is located next to the park’s north entrance in 29 Palms. This is one of the reasons why we love our dark night sky. And the park is continually working with the city, county, and neighboring communities to keep it that way. Buy local art while you are visiting! You may have noticed that we have a lot of venues selling desert art by local artists, from art galleries and gift shops to restaurants, visitor centers, and myriad annual art events. We proudly support arts and culture in our community, and we hope you will, too. Help support the livelihood of our independent artists and creative residents by taking a piece of their art home with you! When you see Marine or Sailor or military family in our community, thank them for their service. The City of Twentynine Palms is proud to be their hometown away from home, and we try to make them feel welcome during their stay in the desert. Many military spouses are employed by our local businesses and some are active participants in our cultural arts. We salute all the service members and civilians aboard the base–the Marine Air Ground Task Force Training Command, Marine Corps Air Ground Combat Center, Twentynine Palms.